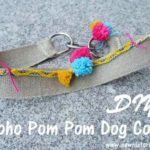 DIY pom pom sandals – from scratch – made with leather and colorful DIY yarn pom poms! 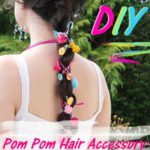 Pom poms are everywhere right now! 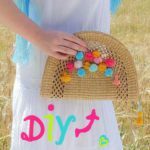 These colorful little yarn balls adorn shoes, hats, bags and the hair! Pom poms add a boho twist to any outfit. 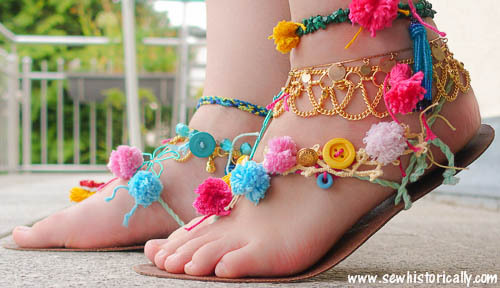 In this tutorial I’ll show you how to make cute DIY pom pom sandals from scratch! 😀 All you need is a piece of leather and yarn. 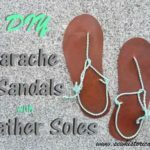 Make DIY Huarache-type sandals. 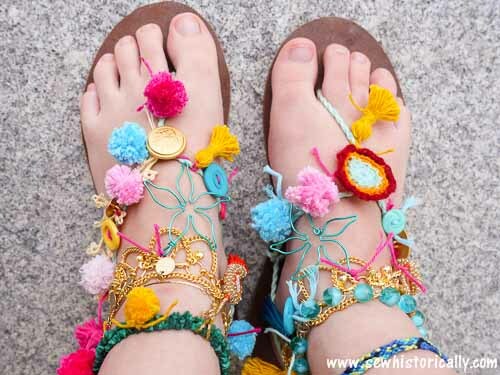 Then use colorful yarn scraps to tie the pom poms to the twisted cords of the Huarache sandals with a square knot. 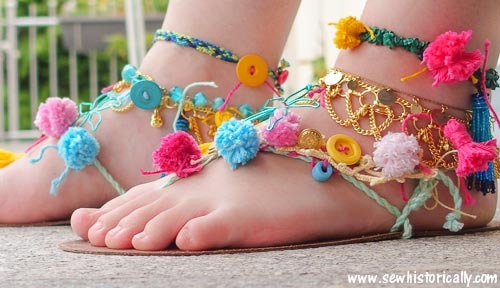 You can also use buttons, tassels and beads to embellish your boho sandals. … friendship bracelets, a tatting sample and a malachite necklace. 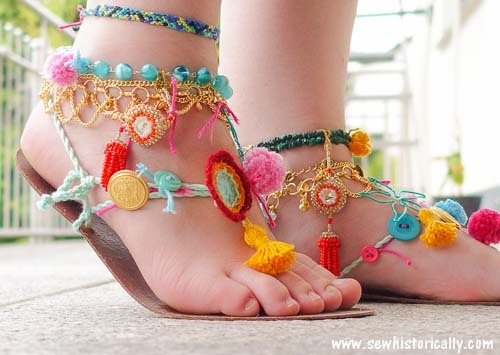 For even more boho flair, wear the pom pom sandals with ankle bracelets. I’m wearing Indian ankle bracelets in gold. Hi and I’m visiting from the I am Pinnable linkup. These sandals are really colorful and cute. I’m sure little girls would love to help make their own. Thanks for sharing. 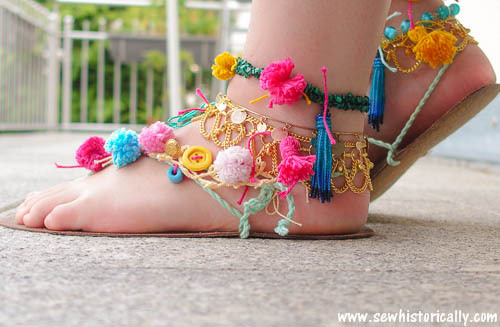 Just hopped over from WasteLess Wednesday to see your beautiful DIY Pom Pom Sandals. These are really amazing! 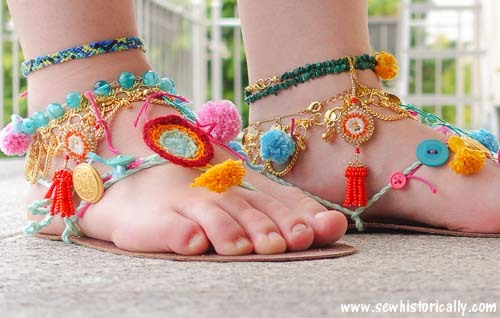 I would love to make and wear sandals like these this Summer. I’m pinning and sharing. Thanks for pinning, Deborah! 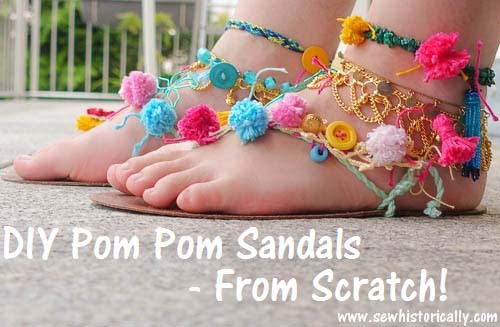 😀 I’d love to see your pom pom sandals when you make them! These are so cute! And a great stash-buster project. 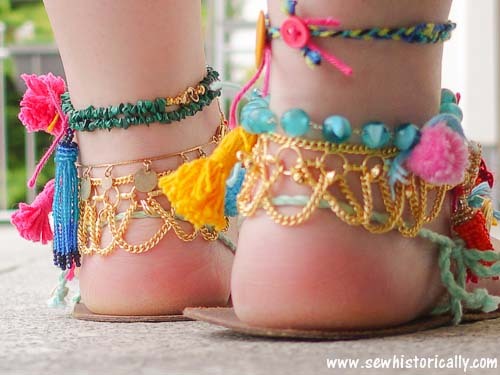 Yesterday after I saw these on Instagram I got all inspired to get some payal anklets. Since I am into Indian dance this summer:) Cannot contain myself! 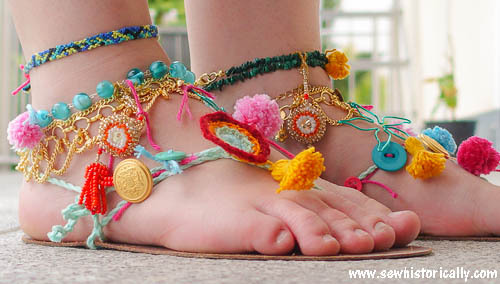 Indian payal anklets are so pretty, aren’t they? 😀 Thanks for stopping by, Milena! Super cute, Lina! Thanks for sharing @ Vintage Charm! Lina, These are pretty awesome! Love them! Thanks for sharing them with us! These look so cute and colourful..These are really amazing! Oh my these are wonderful. They are colourful, fun and super pretty. They are perfect for many occasions and look really comfortable as well. Well done. Yes, they are really comfortable! Thanks, Leanna! These are super cute! Thanks so much for sharing the pattern! These really are so creative and cute! Thanks for sharing them with SYC. They are so cute and they look so summery! All these colors !!! Thanks for stopping by, Dean! Thanks so much for linking up to last week’s Stitchery Link Party. Oh these are gorgeous! So colourful and summery! Thanks for sharing with us at #overthemoon link party. I might have to make them myself as summer is coming to Australia. So VERY fun – a great idea.